I've spent a lot of time in my kitchen this past week. The result: we've eaten some really good food. Not only have I been preparing recipes for the blog, but I've been working hard to make good use of the produce we've received through out CSA. And, as always, I haven't just been cooking, I've been cleaning up too. All that cooking generates an amazing mountain of dishes. Our dishwasher has been out of commission the last two months and will continue to be so for awhile. That means dishes by hand, the old-fashioned way. 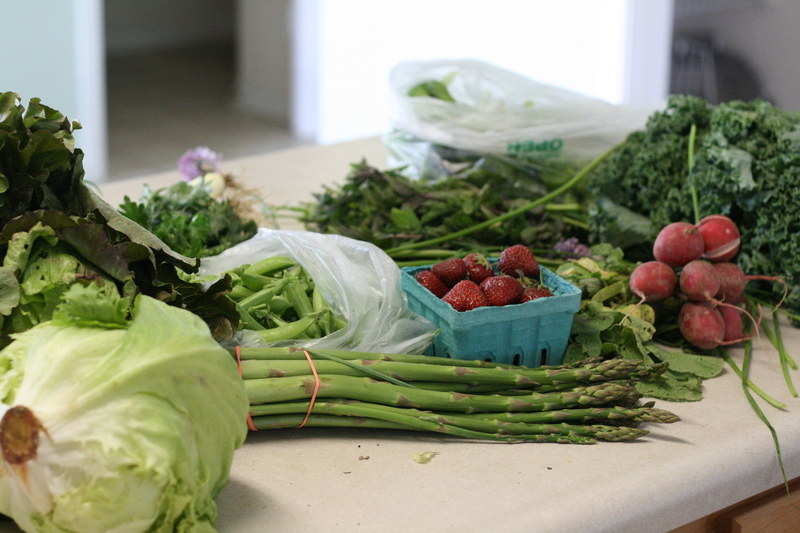 We've gotten strawberries the past two weeks and I could hardly wait to pick up our share and get the berries! I could smell them from afar -- that smell I remember from the hot strawberry fields of my childhood when mom took us for our yearly berry-picking. I contemplated long and hard what to do with the berries, since they were superior to the kind obtained at the grocery store. 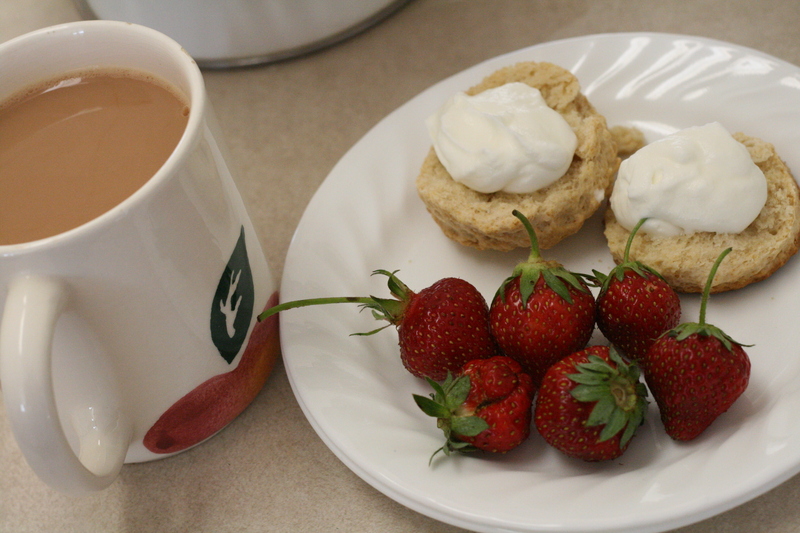 Finally I decided on scones, strawberries and cream for breakfast (with tea of course). Everyone loved it! I'm amazed at the amount of greens we've been getting and I've tried to use some creativity in making our nightly salads. One evening I threw this together, hindered by little time and few ingredients. 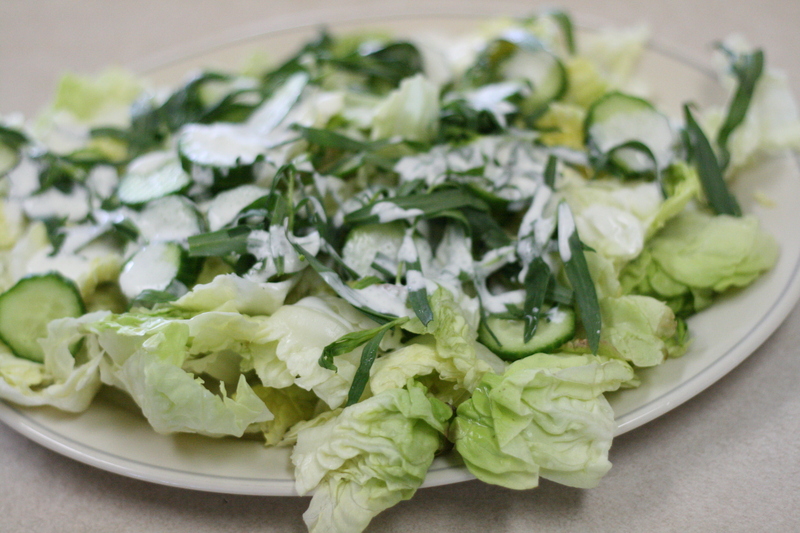 I tore up a head of lettuce, sliced a cucumber (from the store) and sprinkled over torn tarragon. My easiest dressing consists of 1/4 cup whipping cream, one tablespoon water and one tablespoon red wine vinegar with salt and pepper. We're also eating plenty of Kale, and enjoying the fresh asparagus. The radishes and chives head straight into salads and I've been especially enjoying having so much fresh mint, peppermint, tarragon and oregano around. It certainly adds a different dimension to cooking when you can add flavor and color with herbs. Heat broiler, with rack in highest position. In a medium bowl, combine tuna, mayonnaise, onion, capers, lemon juice, salt, pepper, and oregano and stir until thoroughly combined. Arrange bread on a baking sheet and spread a little mayonnaise on each slice (I toasted my bread on each side first -- using the broiler). 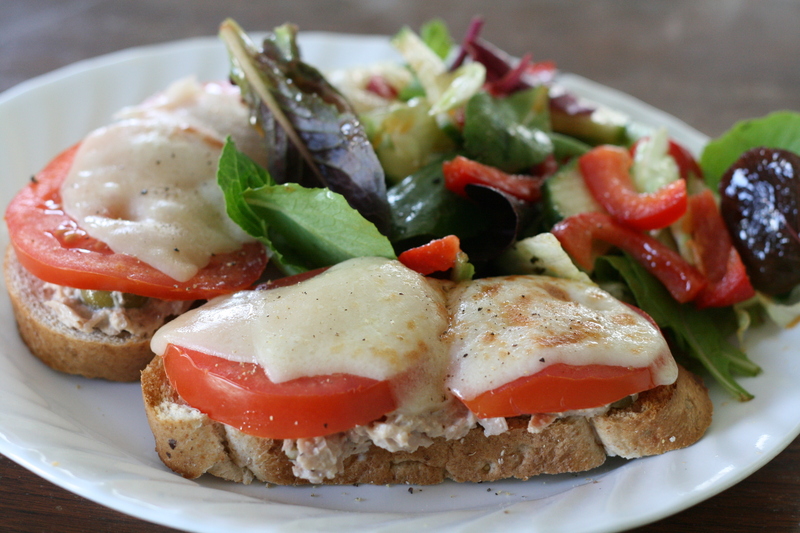 Divide tuna salad evenly among slices, then top each with 2 slices tomato and 1 slice cheese. Broil until cheese is golden brown and bubbling, 3 to 4 minutes. YUM!! This looks GOOD!!! :-D Seriously... and I just bought a tin of tuna. Thanks for the cool idea! !